"By this point of my life I have figured he cannot complete me, even he wanted to. I've faced enough of my own incompleteness to recognize that they belong solely to me"
Finishing a book per week is not a problem for me, however this book took me 3 weeks to finish . Why? I'll tell you why, in this book the skeptic (Liz) finds herself in a situation forced to marry "Felipe". So unlike the fun read in (Eat,Pray, Love) she falls back on all of the flaws that made her previous marriage fall apart and ways to make the upcoming one works . In this book she delves into heavy studies, researches and scholars to understand and quote and resolve in the matter of her divorce . Eventually she managed to open up and accept Felipe as her second husband. Frankly saying, I'm applying many of these studies onto myself, within those 3 week I can admit I am becoming a different person from the inside. I felt as if she kneeled next to me and explained the necessary and un-noticed things with great details. 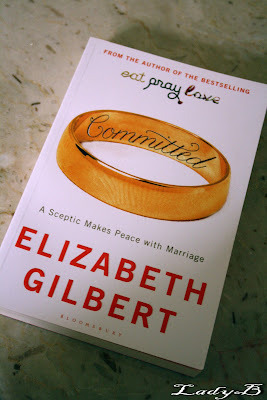 It was a heavy read, may get you bored or give you a headache if you have Liz previous book in mind. But for me it simply fell in the right time slot ! wow i do like "we were looking for something that might simply be possible in each other- a certain shared yearnings to trust and be trusted." i saw the movie to be honest i didn't like the way Julia Roberts act but i can't forgot the scene where she was asking God to show her the way , arent we all in some point in our lives we begged God to show as the real -happy way! amazing.